Radisson to lose Martinique on Broadway? Radisson Rewards only has a few top-tier properties in the US. One of the benefits of the Radisson Rewards credit cards (formerly the Club Carlson Rewards credit cards) is that you can get a free night at any property in the US for each $10K you spend in a cardmember year (up to $30K). Within the US, there are only 4 top-tier properties, and it looks like they are losing one later this year. The Radisson Martinique on Broadway is slated to become a Curio Collection by Hilton property, though it’s unclear exactly when as both programs are selling rooms at the same time. Radisson Rewards currently has four top-tier properties in the United States, with two in the greater Minneapolis area and the others in Chicago and New York. But award availability for Radisson Rewards members completely dries up after June 29th, with no rooms on points (or therefore free night certificates) available for the remainder of the calendar after that. Since Hilton is taking reservations from December 6th onward, I think it’s safe to expect that this hotel will indeed become a Curio Collection hotel at that point, though it seems somewhat curious to see both programs continuing to take reservations beyond that. In fact, Radisson Rewards takes reservations very far in advance — at the moment, you can reserve cash rates as late as December 31st, 2019. However, there are no award stays available that far out. Truth be told, I don’t often closely track hotel changeovers, so perhaps it is common for both programs to continue taking reservations for some time after the switchover date. I know that in most cases, the new management generally honors existing reservations made through the old program and I would expect that to be the case here, though I can’t say with certainty. Assuming that this transition does happen, it is a huge blow to Radisson Rewards credit card holders who spend big for the free annual certificates. While Radisson Rewards does present good value in some ways, there are a limited number of properties where you can feel like you’re getting sizable value out of the annual big spend bonus free night certificates. It’s only one location — but when that location represents 25% of the top-tier properties in the US and 33% of the metropolitan areas covered by top-tier properties, it’s definitely a hit. Radisson Rewards does also have a Category 6 property in New York City (the Cassa Hotel NY 45th Street), so there will still be another New York option for the annual free night certificates from spend, but award availability isn’t likely to become easier to come by with the loss of the Martinique. If you are holding free night certificates with the intention to use them at the Martinique, you’ll want to make a reservation sooner rather than later. I’ve stayed at this hotel a number of times. It is…… Overrated. Weird shaped rooms, poor to average service and generally inflated cash rates for a property in need of a renovation. Seemed to be mostly foreign flight crews and people on tour packages. Interesting post. The city has hundreds of hotels with more sprouting by the minute. How hard is it for Carlson Rezidor to maintain a relationship with one? It’s not like the company has rigorous brand standards. This is a new low. I don’t get the obsession with seeking out and staying at so-called “top tier” hotels. What’s so much better over there? Nicer bed, stronger water pressure, free breakfast or free laundry? Just the fact that you got 70k points worth out of your certificate means nothing. I’ve stayed in several supposedly top hotels where I couldn’t stand it there. My goal is to have a convenient location where I need to be, and Radisson is disappointing on that front in the US because of small footprint the farther West you go. Also, 10k of spending could get you at least $200 cashback, assuming non-bonus category spend. That hotel better be significantly above $200 for the certificate to be worth the hassle. 10k spend on $60 RR card also earns 50k which isn’t all that bad. As for seeking out “top tier” hotels, it’s like anything else in life: different things for different people. Some people seek out the best breweries; I hate the taste of beer. Some people spend $200 on a steak; my sister’s a vegan. Everybody has different wants and goals — whether or not you care about top-tier hotels is certainly a matter of preference. In terms of why people seek these out with reference to this post, the idea is that many people in this hobby are interested in maximizing things. We’re the type of people who, if you said we could play any song on the juke box for $0.25, but we can only play one song, we’d be seeking out the longest Grateful Dead song ever recorded just to say we paid the least cents per minute. And so when there’s a benefit like a “free night at any hotel” (in this case, in the US), many people in this hobby are interested in getting the most value out of that possible. Sure, we could use that night at an $80 per night Country Inn & Suites off the highway that might be every bit as “nice” — but then, like you said, we’re getting a bad deal since we could have gotten $200 in cash back instead. In pursuit of doing better than the $200 we could have earned from cash back, we look for the highest end redemption we can find and use cash in those situations where using the points or certificates is a bad deal. Usually, the hotels in the top category are also the most expensive within the chain. The Radisson Martinique fits the bill in that realm in terms of being one of the more expensive Radisson properties in the US — so if you’re going to get a free night at any property, this hotel would be the kind of place you might want to redeem that night since you’re getting a more valuable thing than the $80 highway Country Inn & Suites (provided of course that you actually need a night at the Radisson Martinique). And again, in this case, you are often looking at getting significantly over $200 in value if you consider the cost of this property / other similarly-located Manhattan hotels that belong to a chain. For example, I just looked up next Saturday night — with tax, the cheapest rate (nonrefundable I believe) is $317. I’ve often seen dates in busier seasons where it has been north of $400. I’ve also seen it in low season for closer to $200 with tax, so it’s not always a slamming value, but it’s more expensive than most domestic Radisson properties. I’d rather pay $80 for the highway-side Country Inn & Suites and not pay cash for a hotel in Manhattan. That’s not to say that the Radisson Martinique is “better” in terms of the hotel itself. It’s location, location, location. I’d rather use my cash when staying in a location where rates are cheap and use things like the free night certificates in a location like Manhattan, where room rates are often high. That’s not to say that you can’t find a hotel that only costs $150. Maybe you can. And if you’re happy with whatever that is and you’d rather pay cash for that and use a 2% cash back card, I have no argument with that — everybody has a different strategy. Also, like sj0 said as well, $10K in spending on the card gets you 50K points + 1 free night at any property in the US. Coincidentally, that means that $10K in spend could get you 2 free nights at the other Radisson property in Manhattan. Next Saturday night, the rate there comes to $343.28. $10K spend on a Club Carlson credit card would get you two nights at that property (one from the free night certificate and one with your 50K points earned based on spend). I’m not sure I’d say you’re actually getting $646.56 in value unless you know you would have paid that much — but two nights in New York City is worth more to me than the $200 I could have earned on a 2% cash back card because I know I’ll spend 2 nights in NYC in the next year and I know I can’t find a comparable property for $100 a night or less. But if you live in Idaho and have no plans to ever travel to NYC, I wouldn’t recommend you do the same — again, different strokes for different folks. Radisson definitely doesn’t make sense for everyone. I’ve stayed here before. It’s nowhere near top tier there are plenty of other hotels to stay in that provide a better experience for less. Two other recent departures still rankle. We’d long planned a journey to the west coast to finish at Fisherman’s Wharf. But nope, we got there a few months after that FW Radisson Blu left the program. Then for next month, I was planning to stay at Philadelphia’s famed “The Warwick” — another long touted (by Ariana & co) Rad Blu there. But nooooo, the Warwick too left the Raddy (ratti?) fold. At the other end, they’re still hawking the Club Carlson/Radisson credit cards as offering up to nine free nights — never mind that there’s now only “ONE” 9k property left in the USA. Pretty soon, honest bloggers (with a bit of courage) can dub Radison to be the “Highlander” chain — where there only can be one property left per category…..
Time to end the charade Rattison. Clean up your brand (s) with something new… not just more and more bad news. Even as A Gold Elite, the “upgrade” room I received at the Martinique was *easily the worst* hotel room I’ve ever had in NYC. From my experience, albeit a couple of years ago, the property was desperately in need of renovation. And even if that were to happen, as another commented noted, the rooms are oddly shaped. It would be extremely hard to stay there again under pretty much any circumstance, for me. New York is already such a weird hotel market. It’s a top destination, which means that even holiday inns go for the higher categories of points. That is, in NYC, you could be paying the same amount of points to stay at a holiday inn in Manhattan that you would to stay at a higher tier hotel elsewhere. 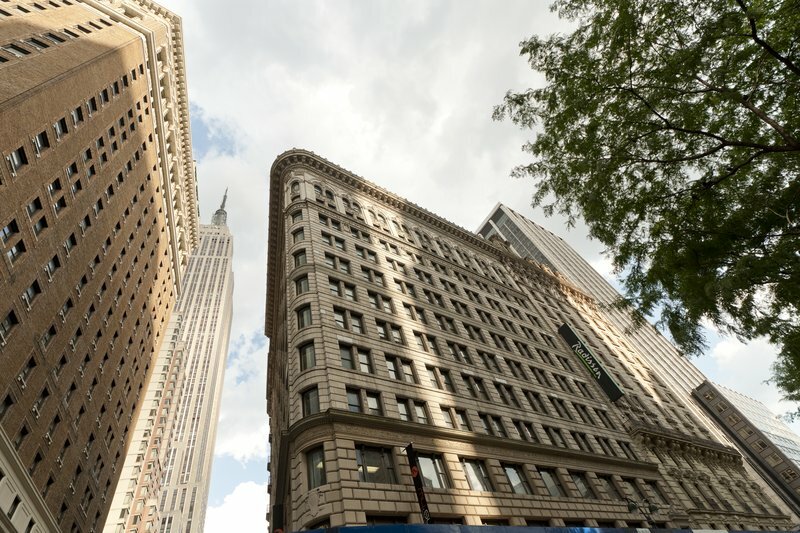 Then there’s all the hotels that are historical and famous in various ways – the Plaza, the Algonquin, the Benjamin – so you’re paying for more than the small room, you’re paying for the history (and marketing).. I feel like that changes the math a little in terms of how “aspirational” properties and/or top hotel category properties are categorized. I guess in that sense the Martinique was having a hard time competing within those categories. Hopefully Hilton will do something nice with it, but judging by the state of their Waldorf Astoria before it closed for renovations, I wouldn’t hold out hope. The Martinique has been our favorite NYC hotel because we could 1) get a very cheap room, and 2) get the breakfast buffet for free, along with a couple of drink chits for the bar. For us it is ideally located practically on top of a subway stop and at the beginning of Korea town with lots of wonderful cheap restaurants. I enjoy the oddly shaped rooms, and 3 times out of 4 we’ve been up on the penthouse floor in a larger room. The only thing I hate is 1) the ROCK hard beds that kills me (true of all Radisson/Carlson Rezidor hotels), and the smoking right outside the entry door that wafts in to the restaurant/bar because of all the foreign flight crews.